addWhat does PokerSnowie stand for? Depending on the context, PokerSnowie may either stand for the AI (the 'brain') or the actual software tool that is powered by the brain. PokerSnowie is the name behind the concept of increasing game proficiency, overall gaming ecosystem health and entertainment value using mathematical modelling and artificial intelligence (neural networks) to develop the strongest, most balanced and ultimately un-exploitable gameplay possible. We want to give everyone the chance to improve their game in an effective yet responsible way for the overall good of the gaming community. We've already put our ambition into practice in the form of BackgammonSnowie, which showed fantastic results and a lot of support from novice and professional Backgammon players alike. With poker increasing in popularity, in addition to the fact that it's a similarly skill-based game with some elements of luck, it was the next logical step in our progression, and resulted in PokerSnowie. PokerSnowie is a very strong No Limit Hold'em poker player. Its knowledge is based on artificial intelligence neural networks and mathematical models, and its experience is the result of trillions of hands of gameplay against itself over the course of a decade. PokerSnowie has no expert knowledge built in and its goal is to develop a perfectly balanced and un-exploitable strategy, making it the perfect partner to help you develop a long term winning strategy. addBut isn't the human element responsible for world-class playing ability? There are occasions where using detailed knowledge of your opponents can pay off in the short term. For example, it's easy to beat a 'Rock, Paper, Scissors' player if he always picks scissors. However, taking this approach also leaves you vulnerable to being exploited yourself by opponents who know what you're doing. Play perfect strategy and even if your opponents know, they still have no counter-strategy against you and you're guaranteed to be a winning player in the long run. addHow is PokerSnowie different to statistical tools or peer-based training/coaching programs? Statistical tools such as HUDs (or heads-up displays) only provide figures on gameplay in order to expose and exploit weakness, and they do not take actual game strategy into account, making them unreliable for developing a long term winning strategy and improving your own game. Peer-based training/coaching programs are based on the opinions and approaches used by highly rated players, but they also inherently contain a lot of subjectivity, which can result in adopting habits that may be detrimental to the development of your game. The problem with subjective advice is that it may not work for everyone and it opens up the possibility of being exploited yourself simply by taking this approach. PokerSnowie is focussed on giving anyone the chance to learn balanced gameplay that cannot be exploited. The overall aim of PokerSnowie is to provide you with the best possible way of improving your game proficiency, rather than looking for weak points in the gameplay of others. PokerSnowie's products enable you to analyze every aspect of your game, pin-point specific errors, provide you with valuable advice on more efficient alternatives, rate your play in terms of numerous variables such as equity, error rate, balance rate and more, and also give you the perfect environment in which to put it all into practice: by playing against PokerSnowie itself! There are simply no other tools or training/coaching options out there that give you so many real, practical, measurable - and proven! - ways to improve your game. addI have a website and I would like to sell PokerSnowie, do you have an affiliates program? Yes, the PokerSnowie affiliate program provides a unique way for your website, or app, to link to PokerSnowie and earn 30% commissions on qualifying sales. Simply join as an affiliate partner, direct traffic to PokerSnowie and we will handle everything else. You can sign up here: http://www.idevaffiliate.com/32296/signup.php. addMy PokerSnowie subscription expired, can I still use PokerSnowie? 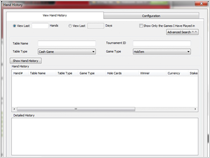 PokerSnowie can be used only if you have an active paid subscription or a free trial. addWhat is the PokerSnowie software capable of? PokerSnowie is a poker training and coaching tool based on the world class gameplay of PokerSnowie. It gives you all the tools you need to take an in-depth look at your No Limit Hold'em poker game, home in on specific errors, correct them, train against PokerSnowie itself and ultimately drastically improve your level of play. addWhat type of hands can I analyze with PokerSnowie? Even if we do our best to stay up to date with the hand history formats of the major poker sites, it has become very challenging to make sure that all the hands are always fully supported. Poker sites in fact are changing them often, they are also changing software providers and so on. If you discover that a format we state as supported is actually not, please contact our customer support at support@pokersnowie.com and provide us some samples, so that our technical team can get to work on it right away. Having said that, PokerSnowie only supports regular hands from NL Hold'em real money cash games including Antes (no Straddles). Furthermore, the hand histories have to be written in English. Play money, tournament or SNG hands are not supported. addWhich Microgaming (MPN) hand history format is supported? Click here to download these instructions as a PDF file. Go to Preferences - Hand History (other MPN skins may have a different menu). Select the required hands (NL Holdem cashgame only!) according to the available options. Click on the "Export and History" button. Assign a file name and then save that file in .txt format which is then readable by PokerSnowie. Summary: 'Preferences' - 'Hand History' - Select and mark hands - export them to a text file. addWhat does EV stand for? EV stands for 'Expected Value'. When browsing through your hands you will notice that PokerSnowie rates your play based on the EV. In most situations, a particular play exists that has the highest EV. There are also situations where different plays, for example a raise and a call, have the same positive EV. Or there are situations where both a fold and a bluff-raise have the same neutral EV. The EV is measured in big blinds. addIs PokerSnowie's style maximum EV at all different stakes? No, it is not. Especially if you play at the lower levels you could win additionally by exploiting specific weaknesses of your opponents. However, if you execute the PokerSnowie strategy perfectly you would still win because the opponents make a lot of errors, from which you would collect EV. addI think PokerSnowie plays way too tight preflop. Why is that? Regarding the ranges preflop: It is clear that against weak human opposition the opening ranges can be much wider. On the other hand, against very strong opponents the ranges of PokerSnowie are optimal. It's also important to note that rake is incorporated in the model. Therefore, at lower stakes (where the rake is proportionally bigger) PokerSnowie plays tighter than at higher stakes. add Does PokerSnowie adapt to players' tendencies? No, it does not. PokerSnowie plays independently of the characteristics of a specific opponent. So it does not take into account HUD stats or the skill level of opponents. Instead, it basically plays a game of super high stakes, where it considers that the opponents are all very strong, too. addWhat is the error rate? The error rate gives a score for how well the session was played. It is independent of the actual outcome and only based on the skill of the player. For every betting round, the error rate sums up the EV cost of all errors, divided by the number of moves played. So the smaller the error rate the better. add PokerSnowie seems to show inconsistent hand ranges - why is that? In some situations there may be an inconsistency between PokerSnowie's advice and the opponent's hand range. For example, PokerSnowie advises to call a bet on the river, while the opponent's hand range doesn't offer the right odds to call. How can there be such an inconsistency? The hand range, however, is a calculation based on the evaluations of the same neural network. All legal hole cards are considered and the evaluations are used to decide which hole cards PokerSnowie would possibly hold in a certain situation. As a consequence, the evaluation may be different than a conclusion based on the hand range of the opponent. This, unfortunately, cannot be avoided; the problem would only vanish if the neural net was a perfect calculation of the game (and not an estimation based on pattern recognition). The hand range can be very sensitive to small changes in a previous round. Two very similar situations on the flop may lead to quite different hand ranges on the river, if a group of hands falls out of the range due to a small EV difference on the flop. Similarly, two slightly different neural nets that play almost identically may have significantly different hand ranges. addHow to buy a PokerSnowie license? On this page you will find information about pricing, subscriptions available and payment methods. add What is the PreflopAdvisor app? PreflopAdvisor is a mobile and web compatible application, based on PokerSnowie's world class gameplay, that advises you on the best course of action for all hole card combinations based on the betting action and positioning of other players in a preflop situation. You start off by choosing between 5 different frequently occurring preflop situations. You then select the positions of both yourself and the other players at the table. A green button will then appear in the middle showing advice on the best course of action in such a situation for all possible hole card combinations. addHow much does it cost? Nothing, it's completely free, forever! add Where can I get it? You can download the PreflopAdvisor app from all mobile stores( ) or access it directly online here. add Can I use PreflopAdvisor on my mobile device? Yes! The PreflopAdvisor app can be downloaded with and run using any mobile device or web browser. addHow does bet sizing work for PokerSnowie? In any situation, PokerSnowie has four discrete options for choosing its bet size: 0.25 pot, 0.5 pot, 1.0 pot and 2.0 pot. This bet size depends on the specific game actions, the amounts of chips at the table, the community cards, etc. It does NOT depend, however, on the given hole cards. That means PokerSnowie chooses the bet size for its whole range of hands that it can hold at this time. Why does the bet size not depend on the hole cards? Imagine the following example: in a certain preflop situation you raise with AA and KK 0.5 pot (to not scare away your opponents), with your medium hands 1.0 pot (to extract good value) and with your weak hands 2.0 pot (to make the opponents fold most of the time). This strategy may work for a few hands, but once your opponents become aware of what you are doing, it is very easy for them to exploit you. A more efficient strategy is to use just one bet size for all hands and not give away any hints about your hand strength. Even though theoretically it can be occasionally correct to have multiple bet sizes in one situation (with different, separately balanced ranges), in practice this would be very hard to implement. Does the bet size change the raising range? if my bet size is 0.25 pot, what is then my raising range? if my bet size is 0.5 pot, what is then my raising range? if my bet size is 1.0 pot, what is then my raising range? if my bet size is 2.0 pot, what is then my raising range? Which bet size gives me the best EV over my whole range of hands? What is the main difference between the raising ranges? In general, the higher the bet size, the fewer the hands that can be used to value-raise. A hand that is a marginal value raise with the bet size of 0.5 pot, will be called only by better hands if it is raised with a bet size of 2.0 pot, and effectively becomes a bluff at a high bet size. The higher the bet size, the more bluff hands can be added to each value hand, because the pot odds for the opponents become less attractive with higher bet sizes. If your bet size is 0.5 pot in the BB on preflop, for example, you should choose hands for bluffing that have enough potential when you get called. The probability of getting called is quite high, so the potential of your hand is really important. If your bet size is higher, the priorities shift a little. If your bet size is 2.0 pot, most of the times the pot ends after your raise and the potential of the bluff hands is less important. Instead, the hands with good potential can be used for calling. Overall, the raising ranges are constructed very differently, depending on the bet size. In general, the 2.0 pot range is much more polarized than the lower bet sizes. Does the bet size depend on the stake level? Yes! Whether you play $0.10/$0.20 or $10/$20 makes a huge difference with regards to the rake. The lower stakes you play, the more severe the impact of the rake. Obviously, the higher the rake impact, the more you want to end the game already on preflop (no flop no drop), so in general PokerSnowie's proposed bet sizes are higher for low stakes. It is unusual (as of today) that players use 2.0 pot as their bet size. Why would that high bet size be correct? When 2.0 pot is all-in and 1.0 pot is not all-in, there is a clear advantage for 2.0 pot: it kills the options of the opponent, he cannot re-raise anymore and is limited to fold or call. When 2.0 pot is almost all-in, then the case is similar to the one above. While not killing the re-raise option completely, this bet size at least cripples the power of a re-raise. Why is there no bet size 0.75 pot? The available bet sizes is a design issue. In retrospect it would have been good to also have a 0.75 pot bet size, as it is a common bet size among players. On the other hand, all our simulations and calculations show that this addition would not have a significant impact on the overall performance of PokerSnowie. Does PokerSnowie play well against unusual strategies? The training algorithm is designed in such a way that the resulting strategy is extremely well balanced and largely un-exploitable. That means that it performs well against all kinds of counter strategies. That also includes counter strategies which use overbets, mini-bets and bet sizes between the ones that PokerSnowie proposes. I see 'Suggested bet size 1 pot' while at the same time the suggested action is a fold or a call. What does that mean? As explained above, the bet size is chosen for the whole range of hands. This bet size is displayed for information only, even when the right action with a specific hand is not a raise.